What is Adobe Muse CC? Adobe Muse CC is a web design platform used by professional designers for building responsive websites with no coding skills required. The web design program tool allows them to create a website from scratch and start by setting up a master page, which defines the elements and parts of their design that will be applied on every page of the website. Thus, they will be able to place logos, maneuver navigation, add footers to their master page, and choose preferred paragraph and text styles. Furthermore, Adobe Muse CC enables users to set up breakpoints so they can create dynamic layouts and versions of their website and its pages that can be viewed on different devices. It also offers fully interactive widgets which allow them to design slideshows, contact forms, and accordion menus, and other content on their website. Last but not the least, Adobe Muse CC allows users to share their website for review or publish it live. One of the most interesting features available in Adobe Muse CC is it using accordion panels. Accordion panels are added on a web page in order for users to expand and collapse its content. Through the aid of the accordion widget, users will be able to set up how accordion panels will respond or behave once they are clicked. Accordion panels can also work with anchor tags. Anchor tags allow a smooth transition from one section of a web page to another. Thus, when viewers click on a particular text or word within a section, they will be automatically routed to a related content found inside an accordion panel. This content is named using an anchor tag. With anchor tags, users will be able to draw the attention of their viewers to a specific content or information on their web page. Meanwhile, Adobe Muse CC enables users to create responsive slideshows. Using its slideshow widget, they can adjust the size of the images and the placement of captions and buttons on their slides. Also, they can create tile structures and define their arrangement for a desktop, tablet, or smartphone layout. The content of their slides will dynamically resize to adjust with the device their viewers are using. Adobe Muse CC also allows users to easily select and edit objects within group sets. For instance, an address on a web page can contain text containers with text objects inside them. Since the text objects follow a hierarchical structure, users normally have to do a lot of clicking before they can edit a text. With Adobe Muse CC’s simple selection method, they just need to click on the object twice, and they can already change it. To test the design of their website, the software allows users to share a link to the website using the Adobe Business Catalyst platform. This platform is built for managing business websites. Once they are ready to publish their website, they can use the file transfer feature in Adobe Muse CC which enables them to launch their website through a third-party hosting platform of their choice. They can also export the content of the site as HTML to a folder so developers can access the CSS styles they created and the images they designed. If you are considering Adobe Muse CC it could also be sensible to analyze other subcategories of Best Graphic Design Software gathered in our database of SaaS software reviews. Enterprises have unique needs and requirements and no software solution can be perfect in such a situation. It is pointless to try to find a perfect out-of-the-box software system that fulfills all your business requirements. The smart thing to do would be to customize the system for your unique wants, employee skill levels, budget, and other aspects. For these reasons, do not hurry and invest in well-publicized leading systems. Though these may be widely used, they may not be the best fit for your particular needs. Do your groundwork, look into each short-listed system in detail, read a few Adobe Muse CC reviews, call the vendor for explanations, and finally select the product that provides what you need. We realize that when you make a decision to buy Graphic Design Software it’s important not only to see how experts evaluate it in their reviews, but also to find out if the real people and companies that buy it are actually satisfied with the product. That’s why we’ve created our behavior-based Customer Satisfaction Algorithm™ that gathers customer reviews, comments and Adobe Muse CC reviews across a wide range of social media sites. The data is then presented in an easy to digest form showing how many people had positive and negative experience with Adobe Muse CC. With that information at hand you should be equipped to make an informed buying decision that you won’t regret. Usable in a lot of ways. 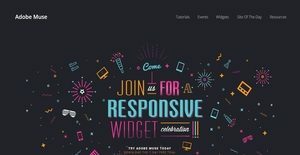 A really enticing software that helps you create websites without having to dab into complex code. Every season is intended for Muse. What are Adobe Muse CC pricing details? What integrations are available for Adobe Muse CC? Adobe Muse CC supports integration with digital asset management systems and project collaboration platforms. Pros: It's relatively simple to utilize. Knowledge with coding is unecessary. Workplace is strikingly similar to its Adobe Suite platforms. It's simple making websites that are responsive. Adobe is frequently updating it and making enhancements on its functionality. Cons: I'd like it if more options were available. By that I mean options for forums. Another is to have additional choices in adding an e-commerce. Pros: I have a backgroun in graphic design. I'm usually a visual individual. What attracted me with Muse is its ease of use. When I initially opened Muse, I was concerned that I'd have a hard time comprehending the interface. But due to it being an Adobe product, it's basically like any other program within its suite. Navigating around it was surprisingly easy. Cons: I wouldn't mention it as something I'd hate with the program. I knew right from the start how Muse has the ability to do things. It's one reason why I'm thinking of using it over WordPress, Wix, or any website builder available. Nothing is above this software. A site creation tool that are both innovative and handy for visual designers. A recommended software when it comes to web design. Designers will be comfortable knowing its all-too-familiar UI. If you need more information about Adobe Muse CC or you simply have a question let us know what you need and we’ll forward your request directly to the vendor.